I am not going to tell you where I live, because I know that you will want to move here, just because I have great neighbors! Neighbors are like family – you can’t pick them! But I consider myself blessed to be surrounded by such lovely people. One set of neighbors happens to be young, generous and willing to hang out with old folks like us! They are hard-working and fun-loving. They are also quite knowledgeable about wine, due to involvement in wine events for a non-profit organization, and travels to the Napa and Niagara wine regions. They host an annual wine-tasting event right in their home, complete with wine barrels, nice food, wine descriptions, guessing games (guess the number of corks in the vase) and favors. 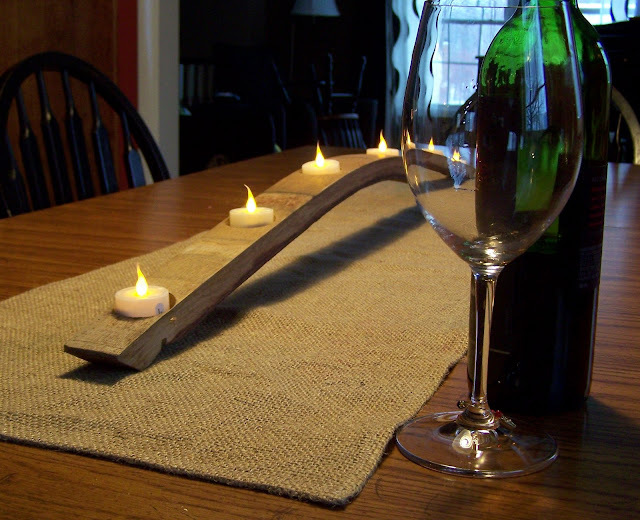 This year, the host and hostess gave each couple this gorgeous, hand-crafted, wine barrel candle holder! They knew I would be especially thrilled with something hand made! It started with a beautiful slat of wood from a barrel. Can you see the red stains on the underside? 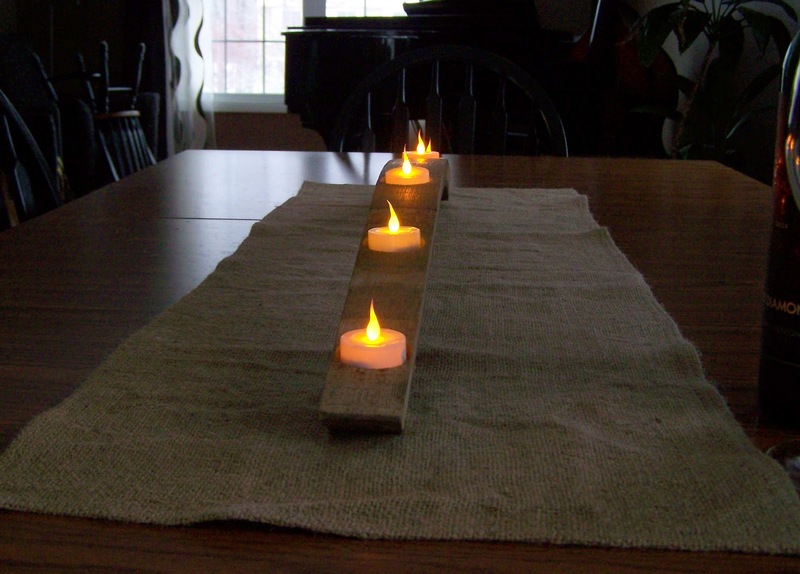 Circular wells were drilled into the wood and filled with lovely tea lights. 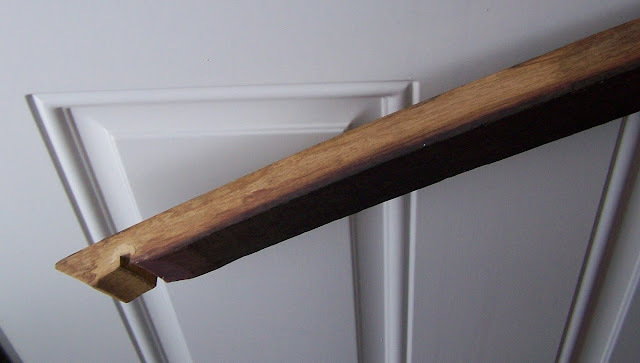 I thought that the wood of the barrel would not be set off by the fake wood of my table. 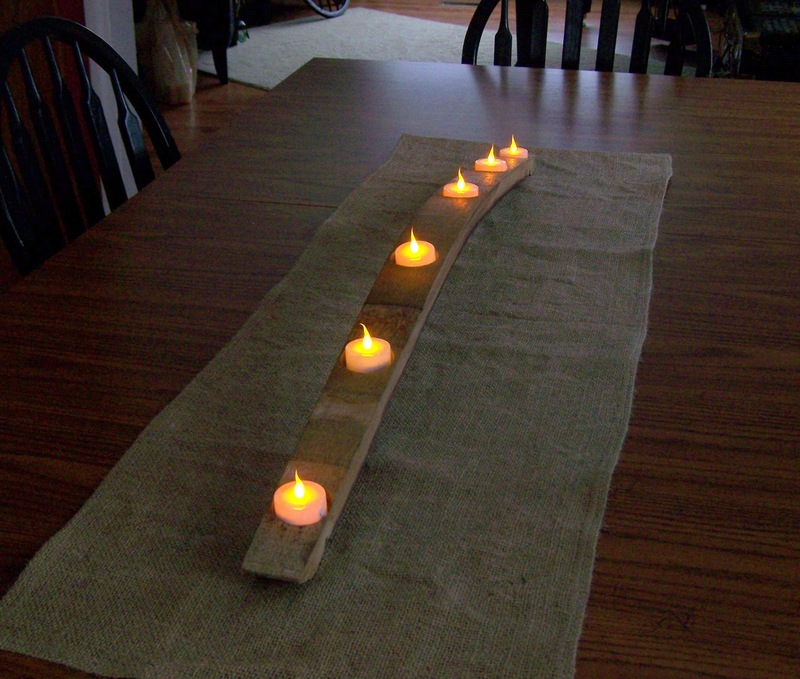 So I made a rustic table runner out of – you guessed it – a coffee sack! I like the way it looks. It’s simple, but helps define the centerpiece. 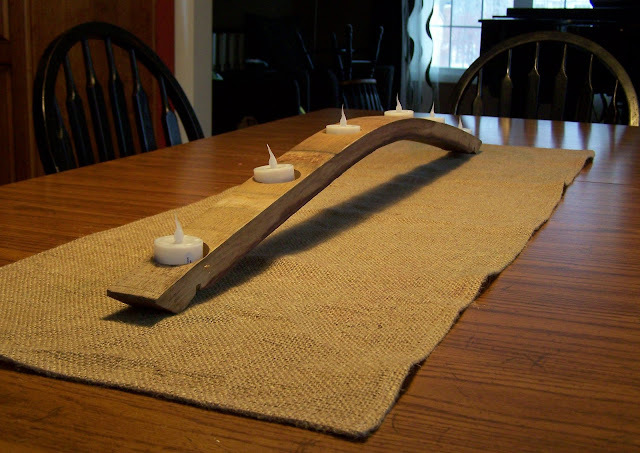 Also, when I do use real candles, it can help protect the table surface in case of any drips. My husband and I consider ourselves sooooo lucky to have neighbors who are like family to us. Thank you guys!!! I love those little tea lights too! I have some at my studio where using real candles could be a big hazard. We also have some at home and my girls get a kick out of the fact they can “light” the candles whenever they want with no worries. I love that candle holder. 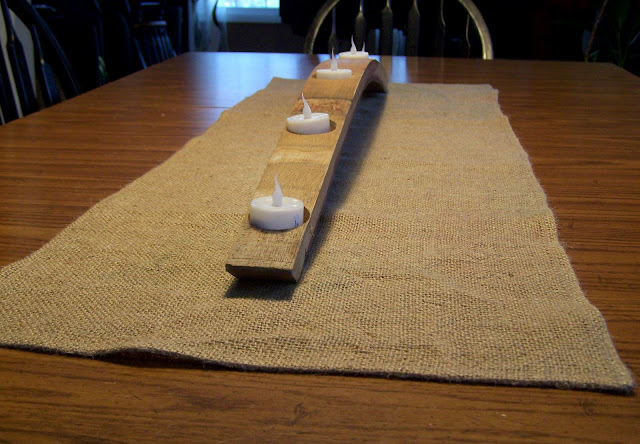 What a wonderful gift and it looks perfect on the coffee bag runner. I like your idea about the tea lights, too. 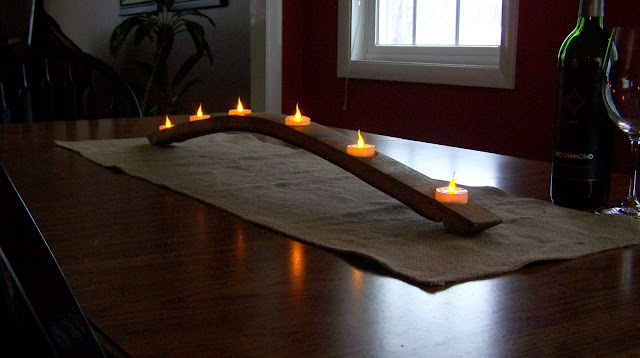 Must get some of those– I won’t use candles because I’m worried the cats will catch on fire!